We currently have 8 women in our program, each from a different background. The unifying factor for each is that access to opportunities in a nation of 1.3 billion people can be challenging to secure, especially for women. Many of the barriers to women’s empowerment and equity lie ingrained in cultural norms. Many women feel these pressures, while others have become accustomed to being treated inferior to men. 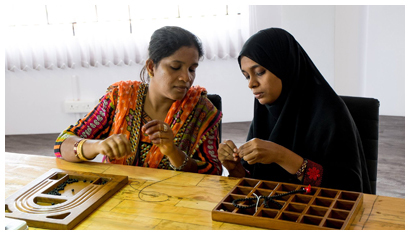 Not every women in our program is in utter poverty, women empowerment is about more than providing skills or income. One of the most important elements is self confidence and motivation. 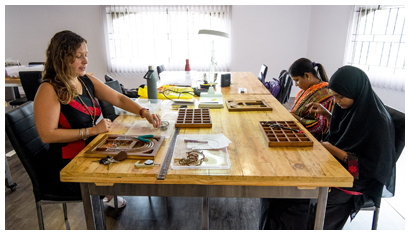 Reshma came to us in the early stages of our jewelry and beading program, with a smile and eager to learn. Margao, Goa. This is our native home. How long have you lived in Goa? Four, My husband, two daughters and I. Do you want to work for somebody or want to own your own business? My husband has a scrap business. I am happy working with Khusi Hona, but ultimately I work for my daughters. Showing them that they don’t have to just sit at home and do nothing because that’s what’s expected from Muslim girls. Being at the Lotus Center also gives me the opportunity to be around like-minded women. How did you hear about the Lotus Center? Nazima (Tailoring Teacher) invited me to come meet with the Khusi Hona team. I wanted to join because I want to work, and at home there is serious need of money. Being a housewife sitting at home one can’t do anything and it’s tough for us. Khusi Hona has given me the chance to create a small business and and to generate much needed extra income for my family. I like the fact that Khusi Hona has been able to provide jobs for housewives like me who generally can’t do anything. Even though I am not at the center, it’s nice to know I have a safe and clean place to call work. Which do you enjoy more the beading or the tailoring? I really enjoy beading, it’s something I can do easily from home and in my free time. What do you want to gain out of the women empowerment program? Moving forward together with Khusi Hona and ability to have a stable part time income. Do you think that there is a in the opportunity disparity you face when applying for a job when compared to men? Yes there is, if we both have the same education the man will definitely be picked and that’s why the center is such a blessing in disguise. It is not uncommon for women in Indian culture to be expected to stay at home. This presents several issues that are obvious, but one of the issues not often discussed is leverage. When a woman is able to take care of her expected home duties and then on top of that starts bringing in income to the family, all of a sudden she has leverage to chime into a family’s financial decisions, or even make a decision of her own such as sending children to a better school. The Khusi Hona Lotus Center is a space for disenfranchised and unemployable women to come and learn news skills through training, employment, and business development. The foundation of this program is to build confidence, foster initiative, and create true empowerment for local women. 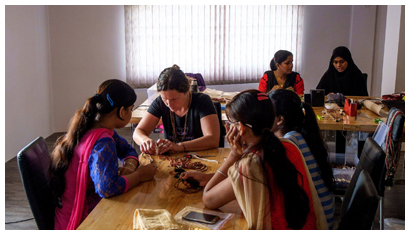 Skilled mentors at the center work with women to develop skills in a non-formal educational setting. Without creating dependency, but rather fostering independence, this will create the opportunity to use this work as a launching pad to realizing their own visions and goals through the creation of micro-businesses, more formalized education, and/or other future endeavors of their choosing. 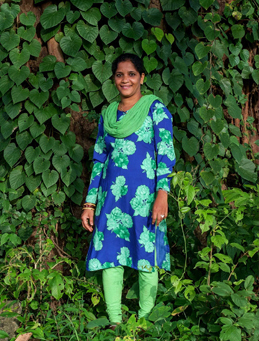 It’s our goal to raise funds for training supplies for women like Reshma. $150 covers our training supplies for one full month at the Khusi Hona Lotus Center. Without support for each of the women in our program we are unable to provide the support and opportunities they require as an outlet for their skills and motivation. If we go over our projected training supplies fund, all funds will go directly towards future supplies. Click here to learn more. Remember, 100% of this donation goes directly to sponsoring women empowerment programs!